These horse-themed games are sure to be a hit at your pony party or cowboy bash. To play this game, you will need two poster-size pictures of horses. You can look for identical horse posters to purchase or draw your own on poster board. You will also find several lengths of ribbon to which you’ve attached a piece of tape to one end. You need one of per player (it’s fun to give each player a different color of ribbon). Hang or prop the posters side-by-side at one end of your play space. Divide the players into two teams and have them line up about 20 feet away from the horse posters. To start the race, the first players in line from each team must run to the horse posters and stick their ribbons on the tail. They must then run back and tag the next players on their team. The race continues like this until all players have attached their ribbon to the horse. The first team to finish wins. To play this game, give out hobby horses to each child. If you don’t have hobby horses, you can ask the kids to pretend to be the horses by galloping around the course. Set up an obstacle course like a horse might run through at a show. You can use jumps, barrels, or a combination of the two; if you don’t have real horse jumps and barrels, replace them with obstacles from around the house or yard or make them out of cardboard boxes. One at a time, have players trot through the course and track the time it takes them to complete it. Award the riders with trinket prizes or ribbons. Place a rocking horse on the lawn. Have your horse party guests stand a few feet away from the horse. Give them a large hula hoop and have them toss it to try and “lasso” the horse. For this game, you can use stick horses or just have the players pretend to be the horses. Have them line up side-by-side behind a starting line. Mark off a finish line about 15 feet away from the starting point. Assign a number to each player. Roll a pair of dice (or one die if you have 6 or fewer players). The child who has been assigned the number it lands on moves forward one step. Keep rolling the dice and moving like this until one player crosses the finish line. A fun idea for this game is to make a large pair of dice. Wrap two big, square boxes in colored paper and draw the dots on each side. You can even have the players take turns rolling the large dice to see who gets to move forward next. To play this game, give each child a stick horse and a pool noodle. Scatter a bunch of balloons around the yard. Set up a square pen by placing stakes in the ground to form a square and stringing yarn from stake to stake to “enclose” it on three sides. Or, you can use small picket fencing (found at the garden store) to build your temporary pen. Have the kids ride their stick horses and use the pool noodles to push the balloons into the pen. Keep playing until all of the balloons have been wrangled. Play this game similar to the traditional version of Freeze Dance. Instead of dancing, kids gallop around or ride hobby horses as the music plays. When the music stops, they must freeze in place. The last horse to freeze is out of the game. The music starts again and galloping continues until the music stops, and they all must freeze again. Keep playing until only one player is left. He is the winner. Purchase two identical horse posters and mount them on foam board. Turn the foam board over to the blank side and draw large puzzle shapes to cover the back of the board. Cut the shapes out. Take each set of puzzle pieces and place them in a pile at one end of the party space. Divide players into two teams and have them race, relay style, to gather their pieces. Once they have all of their pieces, they must put the puzzles together. The first team to complete their puzzle wins. Another variation of this game is to turn it into a scavenger hunt. When mounting the posters onto foam board, use a different color of foam board for each one. Hide the puzzle pieces around the party space. Assign a color to each team and have them search for their puzzle pieces. Once they gather all of the pieces, they can put the puzzle together. Divide kids into two teams. 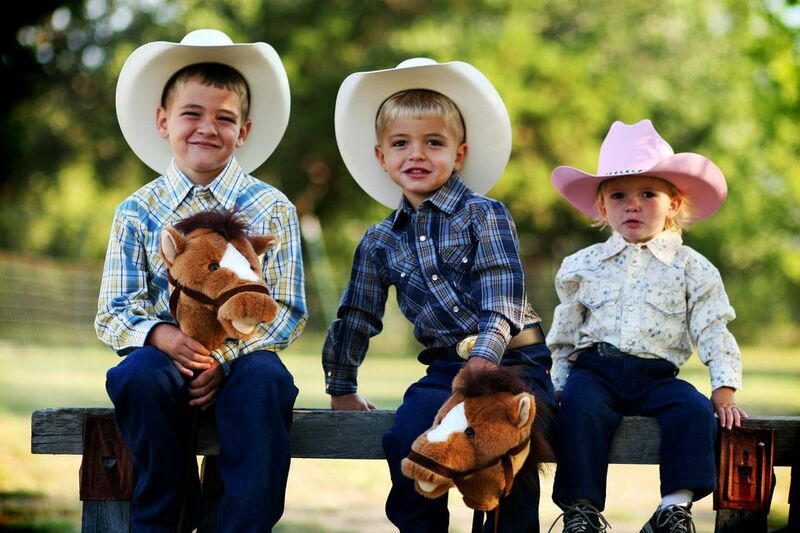 Give each team a hay bale, a saddle, hobby horse, reins, a cowboy hat and a bandana. Teams will race to see who can be first to build their horse, and then have one player put on the cowboy hat and bandana and then sit on the horse. To build the horse: place the hay bale on the ground. Insert the stick horse into the hay bale so that the head sticks out of the front. Place the saddle on the hay bale. To play this game, build enough of the hay bale horses from the Build a Horse game to set up a game of musical ponies (you will need one less than you have players). Set the hay bale ponies up and have kids play just like as you would the traditional game of musical chairs.